Panorama along 6th Street to the east. Oak Glen is a census-designated place situated between the San Bernardino Mountains and the Little San Bernardino Mountains in San Bernardino County, California, United States. Oak Glen is located 15 miles east of San Bernardino, at an elevation of 4,734 feet (1,443 m). The population was 638 at the 2010 census. 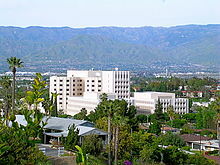 Apple Valley is in the Victor Valley of San Bernardino County, in the U.S. state of California. It was incorporated on November 14, 1988, and is one of the twenty-two incorporated municipalities in California that uses "town" in its name instead of "city." The town is east of and adjoining to the neighboring cities of Victorville and Hesperia, 35 miles (56 km) south of Barstow and 49 miles (79 km) north of San Bernardino through the Cajon Pass. The population was 69,135 at the 2010 census. Temescal Mountains, formerly the Sierra Temescal, are one of the northernmost mountain ranges of the Peninsular Ranges in western Riverside County, in Southern California in the United States. They extend for approximately 25 mi (40 km) southeast of the Santa Ana River east of the Elsinore Fault Zone to the Temecula Basin and form the western edge of the Perris Block. The High Desert at sunset in Johnson Valley, along CA State Route 247. High Desert is a name used to define geographic areas of Southern California deserts that are between 2,000 and 4,000 ft (609.9 and 1219.2 m) in elevation. The High Desert generally refers to areas of the Mojave Desert. The term "High Desert" is commonly used by local news media, especially in weather forecasts, because of the high desert's unique and moderate weather patterns compared to its low desert neighbors. The term "High Desert" serves to differentiate it from southern California's Low Desert, which is defined by the differences in elevation, climate, animal life, and vegetation native to these regions. Comparison example: Palm Springs is considered "Low Desert", at 100 feet (30.48m) above sea level. In contrast, Landers is considered "High Desert", at 3,100 feet (944.88m) above sea level. Yucaipa (/juːˈkaɪpə/ yoo-KY-pə) is a city located 10 miles (16 km) east of San Bernardino, in San Bernardino County, California, United States. The population was 51,367 at the 2010 census, up from 41,207 at the 2000 census. According to San Bernardino County, the projected population in 2012 is 58,187. Location of Eastvale in Riverside County, California. The Morongo Basin is an endorheic basin and valley region located in eastern San Bernardino County, in Southern California. Canyon Lake is a city and gated community on Canyon Lake reservoir, located in the Inland Empire, Riverside County, California, United States. Do you have a question about Inland Empire that you can't find the answer to? For editor resources and to collaborate with other editors on improving Wikipedia's Inland Empire-related articles, see WikiProject Inland Empire.